today i have something phenomenal to share. baking this cake is not optional. neither is reading this post about it. molly wizenberg has the most beautiful style of writing, and as i made my way through her book, i found my mouth watering over recipes that i wouldn't otherwise bat an eye at. for this subtly-spiced cake recipe, her words are no exception. the simple yet pleasureful descriptions and interpretations do everything for this cake, and i knew it demanded a place at our mother's day dinner table. preheat the oven to 375 degrees. grease a 9-inch springform pan with butter or cooking spray. in the bowl of a stand mixer, blend the butter and sugar until light and fluffy. add the eggs, one at a time, beating well after each addition. add the vanilla extract, and beat to blend. add about 1/4 of the flour mixture to the butter mixture, and beat on low speed to incorporate. add about 1/3 of the milk, and beat again. add the remaining flour mixture in three more doses, alternating each time with a bit of milk, and beating just to combine. do not overmix. use a rubber spatula to scrape down the sides of the bowl, and stir to incorporate any flour not yet absorbed. pour the batter into prepared pan, spreading it evenly across the top. bake for 30-35 minutes, or until a toothpick inserted in the center comes out clean. select about 6 of the smaller strawberries and cut uniformly into quarters. these will be added raw to the cooked compote; set aside. cut the remaining larger berries into halves or quarters so that the pieces are about the same size. place them in a medium saucepan. with a paring knife, pull away and discard the strings that run the length of the rhubarb stalks. cut the stalks into 3/4 inch pieces, and add to the saucepan. use a fine grater or microplane to zest the lemon. add 1 teaspoon of the zest to the pan. squeeze 1 tablespoon of juice and add it to the pan. add the sugar and stir to coat the fruit. place the pan over medium-high heat and cook, stirring often to dissolve the sugar. boil for 4 minutes to reduce the liquid somewhat, then reduce the heat and simmer for another 2 minutes, or until the rhubarb is soft. some of the rhubarb will fall apart. take pan off the stove and stir in reserved strawberries. cool to room temperature, then refrigerate in a covered container until cold. + you will have extra compote (recipe makes about 4 cups) but it will keep for a couple of weeks and is delicious for breakfast-- atop a muffin or scone, or paired with crème fraîche. + compote is also decadent spooned over vanilla ice cream. 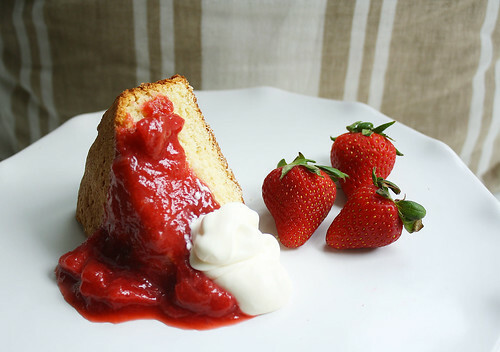 + molly notes in her post that the cake is delicious as a standalone, paired with crushed berries, or with crème fraîche. we opted to do both and it was a good choice. i can vouch though, that it is simple and versatile, thus making it perfect in a number of different ways. + as molly notes, this cake is very nibble-able. i find myself snatching a sliver with a cup of coffee, mid-afternoon, or as i walk out the door.